Game design is a complex business. 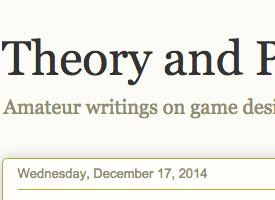 For students it can be hard to find the best information relating to the art of game design. Even someone who considers themselves a master of game creation can benefit from learning more about game design every now and then. Blogs and niche websites offer a unique way of gaining insight into the process of game design and into the industry. People write about their experiences, successes, and failures. This top ten includes everything from learning resources to web series, each tackling an element of game design or the process of design itself. There is a lot to be learned out there, and learning does not stop when you leave college or your training – good game designers are learning right up until they retire! 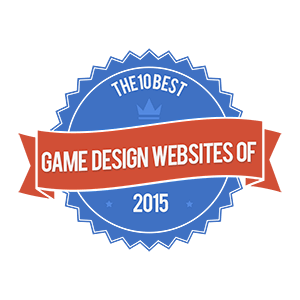 These resources are a fun and factual way to increase your knowledge about game design. 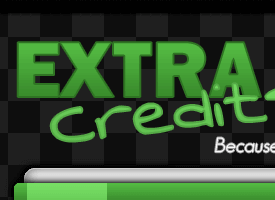 Summary: Extra Credits is a web series, providing short (~5 minute) animated videos explaining and exploring different elements of game design and considerations for designers. Occasionally this takes the form of reviews, where advice to designers is provided in the context of a review of an existing game, but mostly they provide an exploration of game design elements without review or gaming context. It is written by two industry professionals and animated by a third. They also offer personalised advice if you get in touch with them. 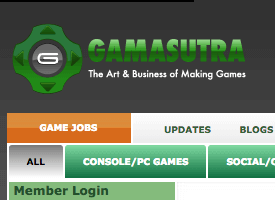 Summary: Gamasutra is a collection of blogs written by industry professionals on all areas of game design; from art to marketing, they’ve got a specialist in the area you’re struggling with. Focusing on an editorial style, most of their articles are opinion pieces rather than exploratory or thought-provoking about the process of design. 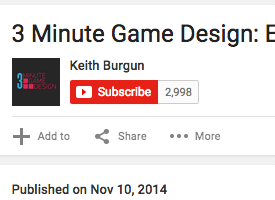 It is an excellent resource of free advice for the aspiring game designer, and even includes a careers section. 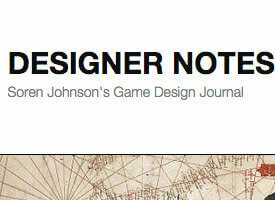 Summary: Designer Notes, by Soren Johnson, is a blog about the ups and downs of being a designer, as well as featuring a lot of extra content such as interviews. Soren has worked on projects like Civilization 3, so knows a lot about the game design industry. His interviews are sharp and informative, and his content is a must-read for anyone who wants to know what it’s like to be a game designer. Summary: Game Design Advance is a bucketload of resources in one – podcasts, reviews, and analysis of game design can all be found at this cornucopia of information for the budding game designer. If you’re more into listening than reading, the podcasts offer insight in short bursts, whereas the blog posts provide deeper analysis. The 300 word reviews are a popular feature, packing a punch in such a short space! 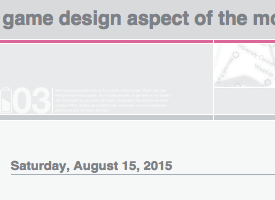 Summary: Another plethora of analysis and insight await you at the Game Design Aspect. Written for the more interested audience, the vocabulary errs on the pretentious and the sentences get a little long. 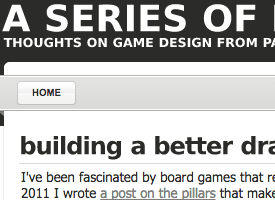 But it’s still an excellent resource and updates regularly with insightful new posts about game design, story, and the craft of making games. A must-read for the more advanced developer and those wishing to improve their skills. Summary: Titled after the famous Sid Meier quote, A Series of Interesting Choices is a blog about the mechanics of game design. With a narrow but deep kind of focus, Interesting Choices is the go-to for in-depth talk about the design of mechanics. Less of the artsy, high-level analysis, more of the nitty-gritty how-it-works. Summary: No longer regularly updating, but still an invaluable resource, Theory and Principles is another high-quality blog about the mechanics of design. About more than just game mechanics, this blog also covers things like the importance of camera angle. The whole thing is a must-read resource for designers and developers on their own, as it provides all the help of a consultant without the cost! 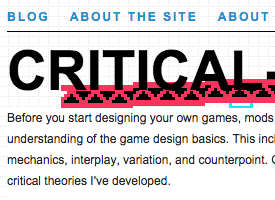 Summary: Critical Gaming’s Game Design 101 provides everything you need to know about game design – from talking about it, to actually doing it. This self-contained course aims to teach the fundamentals of design to hobbyists and budding professionals alike, without the cost associated with formal education. A must if you’re just starting out! Summary: A Youtube series, rather than a traditional blog, 3 Minute Game Design is perfect for those of us with a limited attention span (or those of us who prefer to listen over read). He has a pleasant voice and a sharp insight, always explaining things carefully so as not to leave anyone behind (yet he has a knack for making people feel smart, too). Again, another must for those of us just starting out. 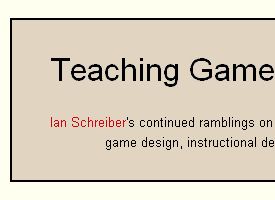 Summary: More of a resource for those who actually teach game design, I include this blog in the list because sometimes its useful to see things from the other side; in this case, seeing material you might be learning from the side of the teacher, rather than the side of the student. It includes a lot of information, if you shift through all the stuff about teaching, on game design and topics such as gamification. Good for the more advanced student, or someone moving into teaching game design. 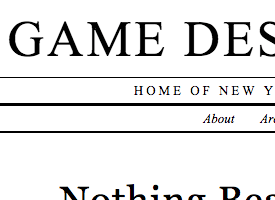 When researching this list, I was struck by the complete lack of active game design blogs. It’s not that people are no longer designing games, I feel, but a lack of willingness to share information about those games. We need to up the transparency in our industry if we’re to succeed together, so if you’re inspired to start a game design blog and have something to say, then do it!